Canterbury - the capital of the English shire of Kent, the shire closest to the European Continent. It was an ancient Celtic and then Roman settlement, where St Augustine arrived from Rome in 597 to convert the Anglo-saxons, beginning with King Aethelbert of Kent, whose Christian wife Bertha was a Frank (another Germanic people). Against the odds perhaps, Augustine succeeded and so Canterbury became not only the part of England most associated with Rome and the Roman church, but the seat of the Archbishops of England and also, after the murder there of Archbishop Thomas Becket (later canonised) in 1170, an important pilgrimage site for pilgrims from all over Europe. Geoffrey Chaucer (c.1343-1400), is usually considered to be “the Father of English Literature” and also to have been the writer who settled the vernacular form style of Middle English (1), a language still somewhat removed from the English we speak today. It is thought he most likely wrote his famous “Canterbury Tales” in Kent in the 1380s; the Tales were about a colourful group of pilgrims on the way to the shrine of St Thomas Becket at Canterbury Cathedral. After Chaucer, arguably the next great literary name known to most English people is that of William Shakespeare (1564-1616), dramatist, poet and, some would say, England’s greatest philosopher, as the English prefer not to take their philosophy neat but shaken and stirred with the drama of the stage. In succeeding centuries, the English came to regard themselves as the people “who speak the language that Shakespeare spoke” – even if not quite so poetically, and held Chaucer and Shakespeare to be the two great paragons of the language. By 1900, in the Social Darwinist and racist atmosphere that was widespread throughout Europe and America in those days, many in the East Coast American elite, as supposed ‘fellow Anglo-saxons’, had come to regard themselves too as the heirs of Chaucer and Shakespeare. And so it was that when, in 1902, under a new King of England, Edward VII (1901-1910) an Anglo-American group of the self-designated “most distinguished people” decided to form a society to “promote good-will, good-fellowship, abiding friendship and an everlasting peace between the United States and Great Britain”, they chose as the central figure for their new Society’s emblem Geoffrey Chaucer as pilgrim, the alleged ancestor of the common language and thus of the common values which they felt they shared across the Atlantic Ocean. For them, these values included not only the English language and literature, but also free market capitalism, Protestantism and individual liberty, which they saw as grounded in the Magna Carta, signed by King John and his barons in 1215, (another of the many commemorations that will occur in 2015). (2) This transatlantic group of “the most distinguished people” called their society, The Pilgrims. Within only a few years, they had become the social crème de la crème and included many of those at the very top of British and American societies, in the nobility, the financial and commercial plutocracy, the military, the upper echelons of Freemasonry, and academia. In those years before the First World War, The Pilgrims were the nest perched at the top of the Anglo-American elite’s tree of power. In their emblem we see Chaucer, elderly, prosperous-looking, rotund – like many of the Pilgrims themselves – with white hair and beard and dressed in reddish mediaeval costume, riding a white horse that looks a bit too small for him. He points the way forward with his left hand. Alongside in the foreground a proud golden male lion heads resolutely in the same direction, slightly ahead of the horse, while on the rump of the horse sits an American eagle, wings folded, also looking in the same direction. 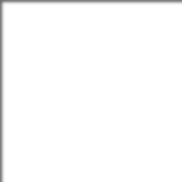 Man, horse, lion and eagle are all heading strongly towards the right of the image, as seen by the onlooker. Around them all is green vegetation in florid mediaeval style. The Society’s name, The Pilgrims, is written in red on a white background (redolent of the Templar and St. George colours) immediately before the face of Chaucer. All four figures are heading towards their own Canterbury, the goal of their pilgrimage. We know something of what mediaeval pilgrims were seeking, but what was the goal of The Pilgrims of 1902? Cryptic clues are given in the two scrolls above and below the four figures. Below them we see words; above the four figures we see images. Below are three enigmatic, abstract, Latin words in eleven letters – HIC ET UBIQUE (‘here and everywhere’, which can only mean the English-speaking people are here – at home – and everywhere in the world: a suitable motto for the age of imperialism); above them, we see four energetic images of physical and technological power, of motive force in the modern age, gazed upon by the now hatless and horseless pilgrim, carrying a staff, his right hand raised, in wonder or in blessing. In the early years of the Society there was a fifth image portrayed – a cigar-shaped airship. This was perhaps later dropped in view of the association of Zeppelin airships with Germany! (3) The emblem thus shows thoughts below, willpower above – a noteworthy arrangement! Chaucer’s Middle English still owed a lot to the pronunciation and rhythms of French, spoken by England’s conquering Norman-Viking upper class, whereas the English of Shakespeare’s time, though sometimes still difficult, is far more recognisable and understandable to us today. In 1958 the senior director of The Times newspaper and chairman of The Pilgrims Society told Richard Nixon (the former US president) that The Pilgrims Society is “the most important Anglo-American Society in the whole world”, but given the occupations and power of the members of the Society, he clearly was not thinking only of language and literature. There were two Pilgrims’ Societies, one in Britain, founded in 1902 four months after the death of Cecil Rhodes, and one in the USA, founded in 1903, but they regarded themselves as twins, joined at the hip, so to speak, essentially one organisation. Some saw them as Romulus and Remus, the legendary twins raised by a she-wolf, who founded ancient Rome, and certainly, many members of The Pilgrims saw the English-speaking peoples as the Romans of their day and themselves as the Senators of Britain and America. Indeed, the two Pilgrim Societies were like Twin Towers of the elites of both countries, and like the Twin Towers of the World Trade Centre, they were of the highest (social) level. The two Pilgrims Societies played a not insignificant part in preparing Britain and the USA for the First World War, and a key target for the western allies in that war was Ottoman Turkey, which controlled Mesopotamia, the region where a new oil industry was growing up in order to exploit recently discovered oilfields; it was therefore a region in which both British and American companies were interested. Turkish-controlled territory also bordered on British-ruled Egypt and the Suez Canal, the Red Sea bottleneck in Yemen, near Aden, and the Persian Gulf – the overland route to British India. The fate and the decisions of Turkey were therefore of great interest to Britain. For their own selfish reasons, desiring to carve up the Turkish-controlled Middle East between them, and also because they had been urgently asked to do so by their Russian ally whose trade was bottled up in the Black Sea by the Turks, both Britain and France launched the Gallipoli campaign against Turkey that was conducted from February 1915 to January 1916 – the commemoration of which is another of this year’s significant anniversaries. As imperialist Powers with extensive overseas empires, Britain and France both ruled large numbers of Muslims. During and after the First World War, Britain and France destroyed the Ottoman Empire, and with its disappearance went the religious-political office of the Caliphate, abolished on 3 March 1924 by the leader of the new Turkish republic, Mustafa Kemal (Ataturk). Thus disappeared an essentially mediaeval institution that had combined the religious and the political life, a linkage which had been associated with Islam since its very beginnings in the lifetime of the Prophet Mohammed (570-632). Since the Second World War, many Muslims from former colonies have sought to improve their circumstances by moving to Britain and France. And gradually, amongst them, some became attracted by fundamentalist, literalist and puritanical interpretations of Islam such as those advocated by the Wahhabi sect, which has been closely associated with the House of Saud since their mutual pact of 1744. With British help from 1914 onwards and with a great deal of extremely bloody violence perpetrated by its fierce military religious corps, the Ikhwan (the Brotherhood), who would normally slaughter all male captives, the House of Saud won out over its Arab rivals. Apart from the pain of the defeat at Gallipoli and the peculiar horrors of the Gallipoli campaign itself, it has not been accorded by the British public the attention it deserves, perhaps because it was fought so far away from what was seen as the main danger – the German Army across the Channel – and was after all a major defeat at the hands of an enemy the British considered to be inferior and ‘finished’ in historical terms. But in fact, the Gallipoli campaign in particular and the war against Turkey in general was of the highest, long-term strategic significance. The Gallipoli campaign was not just another Churchillian bold, dramatic and even romantic effort to strike at the enemy’s underbelly, as it has so often been misrepresented. It had to do with keeping Russia in the Alliance (with Britain and France) – and thus maintaining pressure on the eastern flanks of the Central Powers (the German and Austo-Hungarian Empires, later joined by the Ottoman Empire and Bulgaria) - by gaining for Russia that which the Russians could not gain for themselves, namely Constantinople and the Ottoman-controlled Dardanelles Straits which connect the Aegean Sea – and hence the Mediterranean – to the Black Sea. More importantly for the British, it meant blocking Germany’s advance into the Near East via the Balkans – a railway-borne advance which would have taken the Germans into the new oilfield regions of Iran and Mesopotamia and also too near to that ‘artery of the British Empire’, the Suez Canal and the Red Sea. For reasons of critical economic resources (not least the Royal Navy’s need for the new energy resource of oil) and strategic geopolitics, these two regions were critical for the defence of Britain’s Indian Empire and indeed of the whole arc of control around the Indian Ocean: from Cape Town and Cairo through Baghdad and Calcutta to Singapore, Perth, Sydney and Wellington. As Rudolf Steiner pointed out on 21 March 1921, the British were prepared “to wage war to the knife”(6) i.e. to do anything to maintain their control of this vast region, and the Germans, by driving their Berlin-Baghdad Railway into it via the territories of their Turkish allies, were poking a stick into the lion’s den, as it were, that is, in the eyes of the British ruling elite they were regarded as offending against Britain’s supreme geostrategic interest – the control of routes to India. German historian Markus Osterrieder has pointed out in his new book Welt im Umbruch (2014) (7) that both sides resorted to exploiting nationalism and religion in the Near East as a means of waging war. Both sides stirred up the old Muslim yearning for a pan-Islamic Caliphate, the Germans seeking to unite Muslims under the Turkish Sultan-Caliph, and the British seeking to unite them under an Arab Caliph, Sherif Hussein of Mecca, supposedly descended from the family of the Prophet himself. Most people have heard of Lawrence of Arabia, even if they have only seen the epic film (1962) of the same name by David Lean, starring Peter O’Toole as T.E. Lawrence, so they will be familiar with Lawrence’s role, from 1917 onwards, as a leader of the Arab revolt and promoter of the cause of Arab nationalism and how Faisal, the man he supported, who was the son of Sherif Hussein, was eventually made King of the new client state of Iraq by the British in 1921. But few will have heard of another Briton, active in Arabia from 1909 until he was killed there in January 1915, who arguably did far more than Lawrence, ultimately, to determine the fate of the Near East and indeed of the world as a whole. This was William Shakespear (1878-1915). Not the playwright William Shakespeare of course, but the William Shakespear who was an army captain and then Britain’s Political Agent in Kuwait. The difference in the surnames of the two Williams is only the ‘e’ at the end! There were two competing strategies for how to deal with what the British saw as the existential challenge posed in the region by Germany and its Turkish ally. On the one hand was that favoured by the Foreign Office and the British authorities in Egypt, based in Cairo. With their interest in defending the Suez Canal, they favoured using Sherif Hussein to stir up an Arab revolt against the Turks and to destroy the Berlin-Baghdad Railway which was also intended eventually to reach past Sinai and down to Mecca. Against them was the India Office in London and the British India authorities in Calcutta. Their focus had always been on the head of the Persian Gulf and its adjoining regions: Kuwait, the new oil-bearing regions of southern Persia (Iran) and Mesopotamia (near Mosul) and the overland route through southern Persia to British India, which of course then included modern Pakistan with its Persian border. Calcutta and the India Office were not convinced that the Sherifs of Mecca were strong enough to function as Arab guardians of the route to British India and so they sent Capt. William Shakespear to the region to look for someone who was. Like other somewhat eccentric, romantic and utterly dauntless British travellers and connoisseurs in the Middle East in those days (such as T.E.Lawrence and the remarkable Gertrude Bell (8)) Shakespear was familiar with and respected the culture of the Arabs. He even knew and could recite their classical poetry. Through the personal relationship that he struck up with the head of the House of Saud, Abdulaziz al-Saud (1876-1953; usually known in the West as Ibn Saud. The two men were of about the same age and respected each other a great deal)(9), in Kuwait Shakespear was invited to visit Ibn Saud at his capital in Riyadh in the central Arabian Nejd desert region. Not only did Shakespear ‘navigate’ his way there from Kuwait to meet Ibn Saud, carefully calculating and recording the heights of all the key geographical features en route, he met with Ibn Saud and stayed five months with him (Feb-June 1914). As photography was another of his skills, he took a remarkable series of photographs of Ibn Saud’s milieu and the first photographs of Ibn Saud himself. In a detailed report, he wrote to his superiors in London that Ibn Saud was a leader who “stands head and shoulders above the rest and in whose star all have implicit faith”. For his part, Ibn Saud once told Shakespear ‘in friendly exuberance “my trust is first in God and then you, O Shakespear.” ‘(10). After his time with Ibn Saud in Riyadh, Shakespear, a consummate camel-rider and with his own falcon, continued on across the ferocious Nafud desert (225 km wide) – he was the first European to map it – on to Aqaba and the Red Sea coast, a total distance of 2900 km. He then went on to Cairo, from where he returned to England. In 1907 he had driven by car all the way from the Persian Gulf to England, no mean feat in those days of early automobiles, rough roads and brigands. Shakespear played a key role in creating the British links with the Arab force that he felt would best serve Britain’s imperial interests in the region – the Saudi Arabs and their network of tribal allies. His work eventually led to the Treaty of Darin (December 1915) between Britain and Ibn Saud which made Saudi lands a British Protectorate, and provided the Saudis with £20,000, 1000 rifles, and 200,000 rounds of ammunition. (11) But Shakespear was killed in January 1915 while observing a battle between Saudi forces and those of their traditional, and pro-Turkish rival, Ibn Rashid. He had refused Ibn Saud’s request to withdraw or at least wear Arab dress. He wanted to “see the show”, believing it would not be “unsafe”. But he was shot in the thigh and trampled by enemy cavalry. After his death, and the Treaty of Darin, further treaties with the British followed in the 1920s. 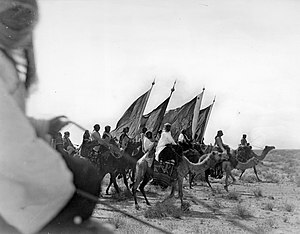 British money and weapons helped Ibn Saud to destroy his rivals, capture Mecca (1925), become King of the Hejaz (1926), suppress the Ikhwan (1929) and eventually establish the Kingdom of Saudi Arabia in 1932. It was William Shakespear’s personal relationship with Ibn Saud that opened the door to all this, a relationship that was then built on by others. Ibn Saud declared in 1929 that Shakespear was the greatest Englishman he had ever met, and in May 1932, on the eve of founding the Kingdom of Saudi Arabia, he sent his son Faisal to London to ask the British to help the Saudis develop prospective oil reserves in their country. Sir Lancelot Oliphant at the Foreign Office in London turned down his request, and so, on the advice of a British Political Agent who had ‘gone native’, as the saying went – Harry St. John Phillby, father of the later infamous Soviet double agent Kim Phillby (12), Ibn Saud turned to the Americans. After the American company California-Arabian Standard Oil discovered oil in Saudi Arabia in commercial quantities in 1938, Ibn Saud did a deal with Roosevelt at the Great Bitter Lake in Egypt on 14 February 1945, giving the Americans the prime oil rights in his kingdom, thus effectively cutting out the British; this deal became the basis of the American-Saudi relationship that has continued until today. 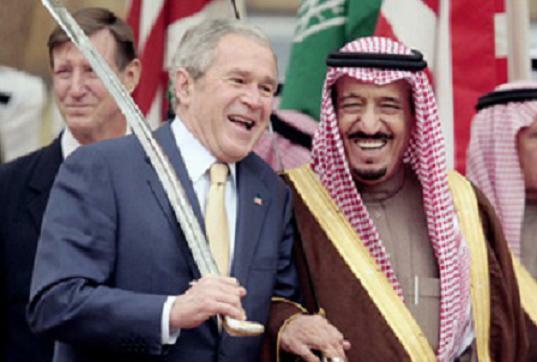 But in their deals with and support for Ibn Saud, the British and the Americans had to accept what came along with the House of Saud, which was the intolerant fundamentalist sect of Wahhabism which had inspired and supported the Saudis since 1744. In accordance with that original pact with Muhammad ibn Abd al-Wahhab, the founder of Wahhabism, the Saudi ruler Muhammad bin Saud was to be the imam, the political and military leader of the Muslims, and al-Wahhab was to be the religious leader. In return for al-Wahhab’s religious support, Muhammad bin Saud committed the House of Saud to “jihad against the unbelievers”. The Saudis’ colossal oil profits have enabled the Saudi kings to spend billions of dollars financing the spread of their fundamentalist brand of Islam throughout the world wherever there are Sunni Muslim populations, no matter how small, through the building of Islamic schools (madrasas), of mosques and of Islamic departments in universities. A Saudi report for the royal family in 2002 stated that the Kingdom had to that point, built 210 Islamic centres, over 1500 mosques, 202 colleges, and 2000 schools around the world (13), But without the help of the British, and Capt. William Shakespear in particular, the great English friend of the founder of Saudi Arabia, none of this might have happened. And this is also no doubt why the English-speaking world has heard so little of Capt. William Shakespear and so much of the more romantic – and more distracting – ‘Lawrence of Arabia’. For any association – with or without a final ‘e’ – of the name of the English-speaking world’s greatest poet, dramatist and, arguably, ‘philosopher’ with the success of the most intolerant, fundamentalist and violent sect of Islam and with Islamist terrorism, now so ‘necessary’ as a bogeyman to the aims of western Powers in the region, would not exactly be music to the ears of the Anglo-American elite, who are ever ready to praise “the greatness of the language that Shakespeare spoke”. The murder of Thomas Becket in 1170 by King Henry’s knights was a result of the tensions that inevitably arose in this dualistic political-religious system that was a feature of consciousness in the 4th Post-Atlantean epoch, when politics was trying to emancipate itself from religion. Islam tried to avoid this dualism by returning social affairs to an earlier, more unitary epoch: before the separation of politics and religion. But in the long run, this cannot hold. Human consciousness has to develop. Unity, in which all is ultimately under religious control, has over time given way – across the world, from Japan to Britain – to a political/religious dualism which, in turn, is now encountering the messy but inexorable emergence of a threefold social organism in which economic life is now emancipating itself from politics and religion. Amongst Steiner’s many contributions to help understand human development is his elucidation that human consciousness develops over time through epochs of civilisation and that there are three spheres of activity that have gradually emerged in social life over the millennia, namely, the sphere of Culture (which includes religion), Rights (politics) and Economy: a threefold development. To enable a dynamic threefold society and culture to come about, in which these three spheres (culture, politics, economy) are mutually interacting but none of them dominant over the others – three spheres in one society – is a major social task of our 5th Post-Atlantean epoch which, in 2015, we are not even yet one third of the way through. It is interesting to observe that many Englishmen in the 19th and early 20th centuries – and some women (such as the intrepid Gertude Bell) – disenchanted by what they saw as the spiritual aridity of England’s religious life, frustrated by the abstract arguments of English party political life and repelled by the early, often ugly and morally repugnant results of capitalism’s effort to break free from political control, were drawn to what they saw as the pure and simple nomadic life of the Arab Bedouin who seemed to these English ‘sophisticates’ as still dwelling in the world, the camps, the tents and oases of Abraham, who was after all the father of Ishmael, the original ancestor of the Arabs (Gen. chs. 16, 17). While in their outer life still doing their duty as servants of the British Empire, there was, to a greater or lesser extent, in the souls and imaginations of the likes of T.E. Lawrence, Gertrude Bell and William Henry Irvine Shakespear, something of the nature of pilgrims, seeking redemption though contact with an ancient culture and an ancient land, in the inspiring infinity of the desert, seeking perhaps, as complex and confused modern people, a return to ‘the simplicity of a primordial Oneness’. It seems to have been with something of this spirit or longing that Capt. William Shakespear went on his long ‘pilgrimage’ across the sands of Arabia in 1914 to meet his respected friend, Ibn Saud. Little did he know what enormous historical consequences would follow from their relationship, or that within a year, it would bring his death. Founded in 1922 to promote the solidarity of the British Empire and to maintain and literally broadcast ‘British values’, which in those days were the values endorsed by The Pilgrims Society among others, the BBC started a short series of radio programmes on Saudi Arabia in March 2015, two months after the death of King Abdullah, one of Ibn Saud’s 45 sons. The first episode dealt with the history of the country from the 1740s to the 1970s. The man whom Ibn Saud called the “greatest Englishman” he had ever known, Capt. William Shakespear, was not mentioned. (2) Magna Carta was, however, essentially about asserting the liberties of the few (the barons, the Church, the City of London) against the one – King John. (3) Zeppelins raids on Britain began in January 1915. (4) The CFR too chose a man on a white horse and the word UBIQUE as its logo. (5) The long march refers to the Chinese Communist Party’s trek through China in 1934-5 to escape its Nationalist enemies. “a more perfect union” is a phrase from the preamble to the US Constitution (1787). (6) Lecture of 21 March 1921, GA 174b. (7) Welt im Umbruch – Nationalitätenfrage, Ordnungspläne und Rudolf Steiners Haltung im Ersten Weltkrieg [World in Upheaval – The Nationalities Question, World Order Plans and Rudolf Steiner's Stance in the First World War], Freies Geistesleben, 2014. (8) 1868-1926: English traveller, writer, archaeologist, spy, political officer. Played a major role in establishing the British client state Kingdom of Iraq in 1921. A movie on her life, “Queen of the Desert”, directed by German director Werner Herzog and starring Nicole Kidman as Gertrude Bell, premiered on 6 Feb. 2015. (9) Ibn Saud, the first King of Saudi Arabia from 1932, was the father of King Abdullah, who died 23 January 2015. (12) Harry St. John Bridger Philby (1885-1960), Arabist, political officer, intelligence officer, Muslim convert; advisor to King Ibn Saud; Harold Adrian Russell “Kim” Philby, (1912-1988), British and Soviet intelligence agent, one of the “Cambridge Five” spy ring; defected to USSR in 1963. (14) Sunni and Shi’ite Muslims are divided essentially only on the question of whether the umma must be led by a blood descendent of the Prophet; they are not divided on the issue of the need for a Caliphate itself. (15) It is of interest that, by making himself Head of the Church of England, and thus claiming to govern both the political and religious spheres, King Henry VIII (1509-1547) was actually, in a sense, returning to the 3rd epoch!